We are looking for the real fan of classic cars and roads. Hey! Are you there? 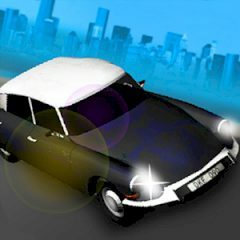 In this game you will play as a driver and there is no police or any others cars. Just sink into the world of speed and gas. Use arrow keys to move and show everyone that you are the best driver! Welcome to the cool city of roads. This is desert city, so be ready to enjoy the great landscape! You have a great chance to learn what it was like to drive these big, heavy cars with very little grip or grunt here. Just practice your turns or just drive as fast as possible, by the way you must be careful, cuase the break is not so quick. This game has a lot of advantages, if you will loose, just restart it. Are you ready to become a master of driving in this exciting game? Use different cameras and you will definitely love this game.